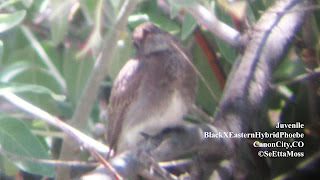 I have continued watching the area near where the male Black Phoebe and probable female Eastern Phoebe nested as I did catch a few glimpses of at least one fledgling. I finally got a good view of the phoebe in these pics a few days ago but had hoped I would get some clearer photos to post so held off. These pics are digiscoped (hand held camera to scope) at distance of about 75 feet. Since I took these pics I have only seen glimpses of a possible offspring of this mixed phoebe pair.